Ukrainian army tanks were reported to be launching an assault to break pro-Russian rebels’ hold on the eastern city of Donetsk on Monday in the first major outbreak of hostilities in the area since Malaysia Airlines flight MH17 was shot down last week. The provincial capital is being used as a headquarters to coordinate the cleanup, recovery, and investigation of Malaysia Airlines flight MH17. The attack on Donetsk by Kiev’s forces will further complicate efforts to recovery bodies, bring impartial, international investigators to the crash site, and arrive at the truth of what happened to the doomed flight. One article in particular by the Daily Mail titled, “A chilling echo of Nazi death trains as MH17 victims begin the grimmest journey,” goes as far as comparing the separatists to Nazis simply for utilizing refrigerated train cars to store dead bodies while awaiting international investigators who still have not arrived on the scene. 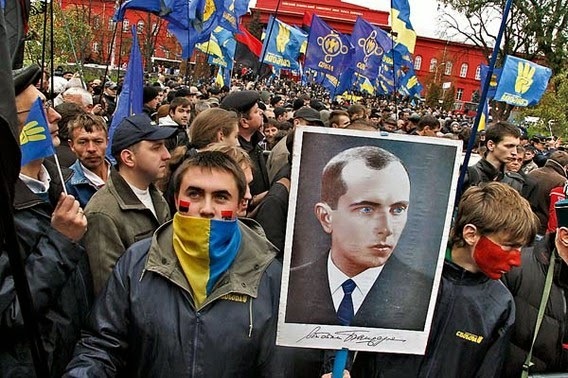 Image: Unbeknownst to the average Western viewer, the man whose picture was held by “Euromaidan” protesters throughout late 2013 and early 2014 was none other than WW2 Nazi collaborator Stepan Bandera. 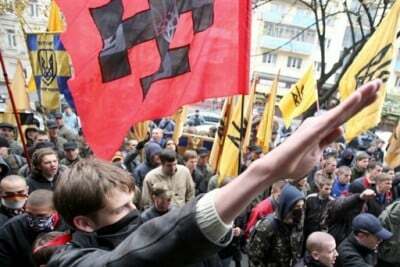 In the picture above, the blue and gold “three-fingered” Svoboda flag can also be seen – Svoboda being one of 3 main parties leading the “Euromaidan,” and unabashed Neo-Nazis. For the Daily Mail to compare the people of Donetsk to Nazis, when their ancestors fought them in WW2, and the current regime in Kiev collaborated with them, exposes the level of vile, amoral degeneracy the Western media is currently operating on. The dubious propaganda piece trying to compare storing dead bodies on a refrigerated train after an air disaster to the Nazis’ practice of putting live prisoners in boxcars to transport them to prison camps is particularly tasteless and misleading, considering many of the Nazi’s victims put on those trains were the ancestors of those in Donetsk today fighting the fascists in Kiev – fascists who openly venerate Nazism and WW2 Nazi collaborators like Stepan Bandera, whose image was ubiquitous during the so-called “Euromaidan” protests. If and when any meaningful investigation gets underway, the narrative the West has been baselessly propagating will begin to unravel, just as it did in Syria following the August 2013 Ghouta sarin gas attack. Attempts to frame Russia for the disaster without evidence continues unabated, as does the mockery of the people in Donetsk who are struggling to cope with their own limited resources and the “intentional community’s” sluggish and so far inadequate response. “The eyes of the world are on eastern Ukraine, and we are going to make sure that the truth is out,” he said at the White House. It now appears that the very regime the US has backed since they violently seized power in Kiev in late 2013-early 2014 have both broken the ceasefire agreement and are jeopardizing the truth the US demanded “comes out.” The continued contempt for truth, due process, justice, and the rule of law exhibited by both the West and their various proxies around the world betray the image of “international norms” and “law” Washington, London, and Brussels purportedly subscribe to.